When I tell you guys that this jacket has been on repeat for me every single day, I am not even kidding. I have talked about this jacket a couple of times now, but I wanted to tell y'all why it's really the best. This jacket is so warm because it covers down to your thigh, so it keeps you super warm. I wore this and my jean jacket on New Year's Eve when it was 24 degrees outside and I was warm the whole time. It is by far one of the best coats I have ever owned. Luckily when I got it it was only $25 which is a total steal! Not only is it amazingly warm, it's also extremely cute. This one from Target is a great dupe for the Sam Edelman one that looks very similar. The gold hardware gives it that luxurious look that I was looking for in a coat, I just was not looking for a luxurious price tag. 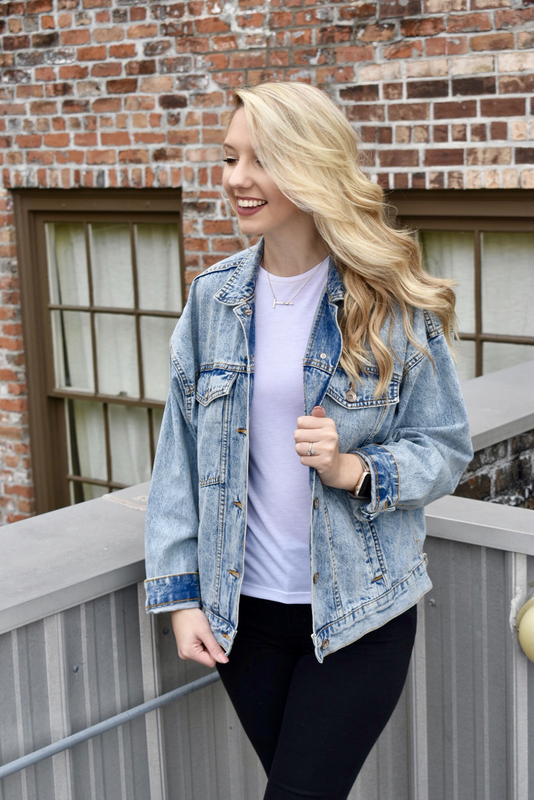 This jacket works so well with so many outfits! I'll attach some pictures below of how I have styled it already for some inspo! Y'all I have been throwing this jean jacket on top of everything! Whether I'm throwing on a big t-shirt and leggings or planning an outfit I always try to throw this on top! It is the perfect accessory and the best part is that you can carry it through the seasons. 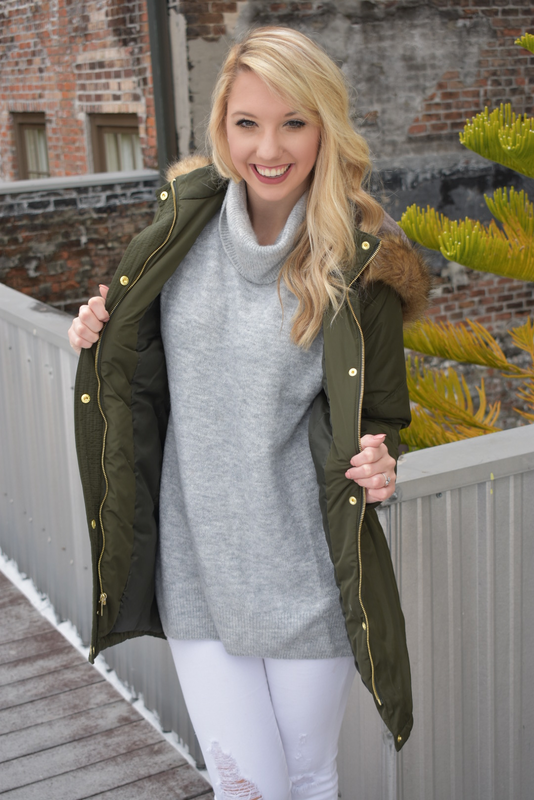 For our current winter season, you can easily throw this jacket on top of a sweater for a different look than just a sweater! You can also throw it on top of a tshirt just like I did and give the tshirt a more structured look than it would have without it. For the springtime, this can easily be thrown on top of a sundress, t-shirt dress, or romper. As springtime approaches. 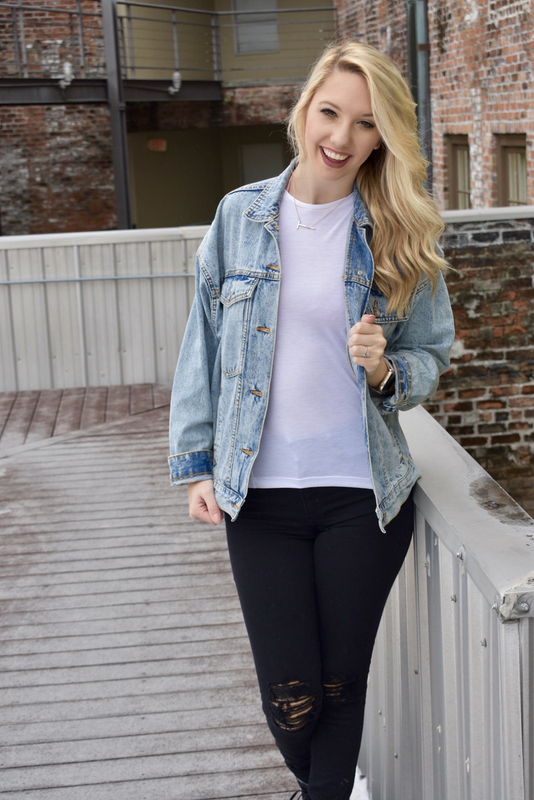 I'll be doing a post on how to bring this jacket into the spring with you! If you order this one, keep in mind that it is a trucker jacket. That means that it already has an oversized fit to it! So buy your true size for an oversized look like mine has! This puffer jacket is not for everyone, and I totally understand that. But, it is the perfect accessory to add to your wardrobe to step things up a notch. I picked THIS one up from American Eagle while it was on sale and was so excited to style it. I wore it last week with a Saints jersey to Saints game last week, but wore it with a navy sweater (similar one linked HERE) and THESE jeans today. 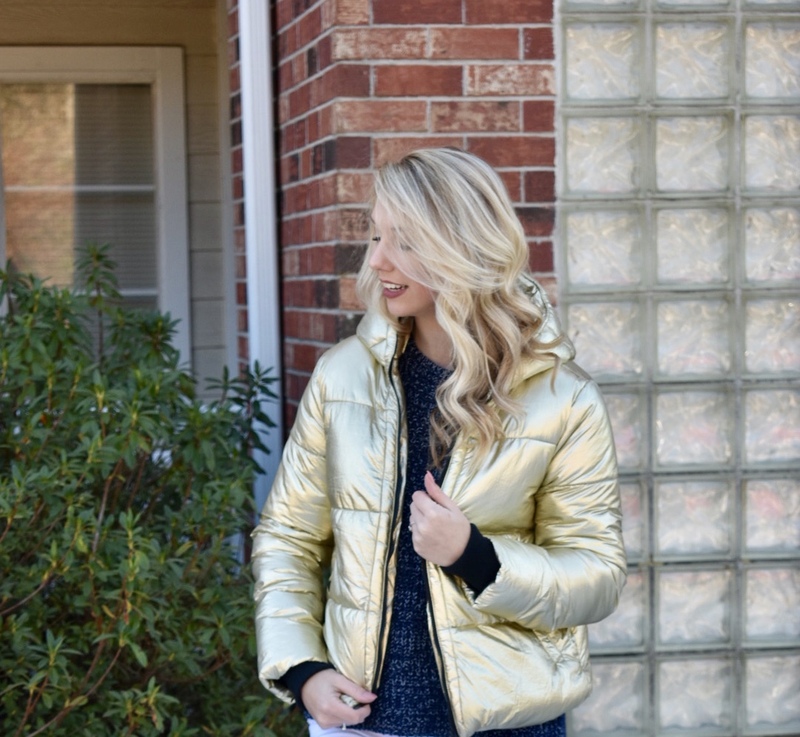 It is a lot more versatile than you would think a bright gold puffer jacket would be. 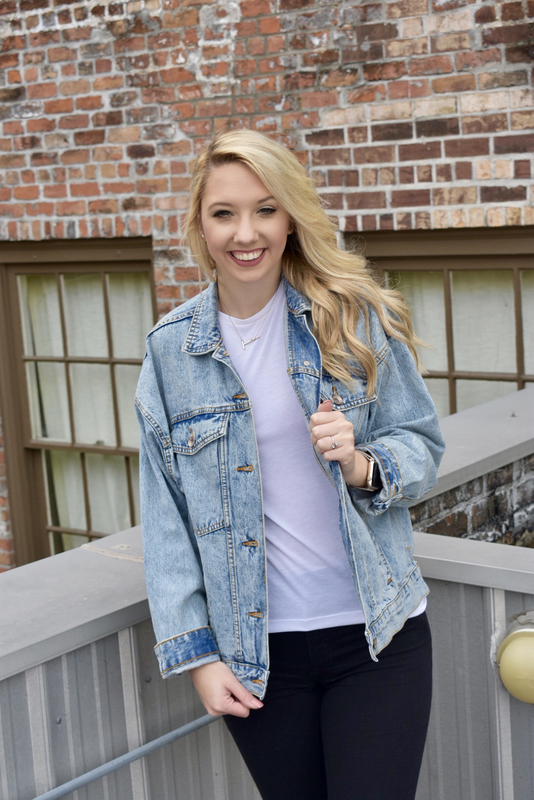 This jacket is so fun and will brighten up your day! This jacket however is not a boyfriend liked jacket, Trevor hates this jacket hahah. Also, did I mention that it is still on sale for $27 instead of $100! So, what are you waiting for? Okay, before I even start about this trench coat I have to break the news that it is no longer avaliable. When I tell you guys I got this coat back during my sophmore year of high school I am not kidding. But, I am linking some similar options and some great trench coats right HERE, HERE, and HERE. So let's talk about styling one of the original fashion icons and how you can bring it into spring with you. 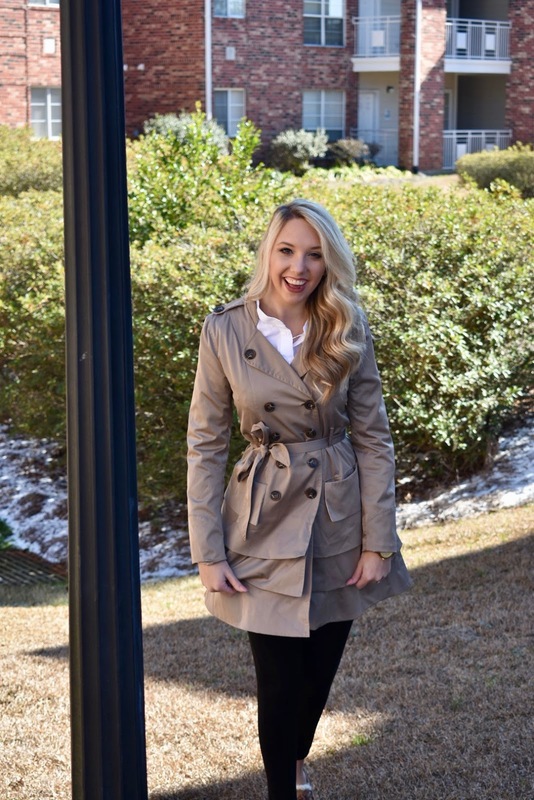 For this look I put a plain white oxford shirt underneath the trench and paired it with my Calvin Klein structured leggings. These leggings look like a tuxedo pant almost but fit and feel like a legging. What more could you want? It made this outfit look very put together and ready for work, a meeting, or even a day on the town. Let's talk about how you can bring this coat into spring with you. Depending on the weight of the jacket, mine is very lightweight, determines if it can be brought into spring or not. Since mine is lightweight I can easily throw this over a sundress to amp up the look with some booties, when it's a little cold out. 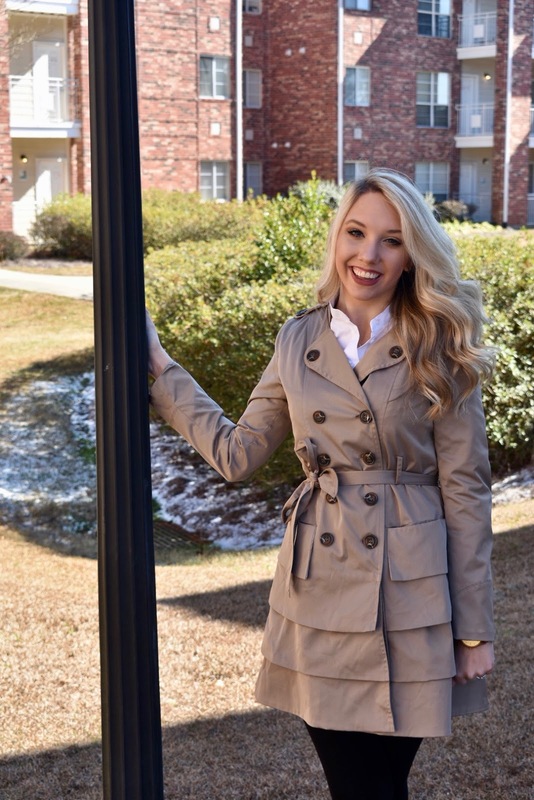 A trench coat is such a staple in anyone's wardrobe and if you do not already have one, I am here to tell you that you need one. They are a staple and can be worn so many ways. 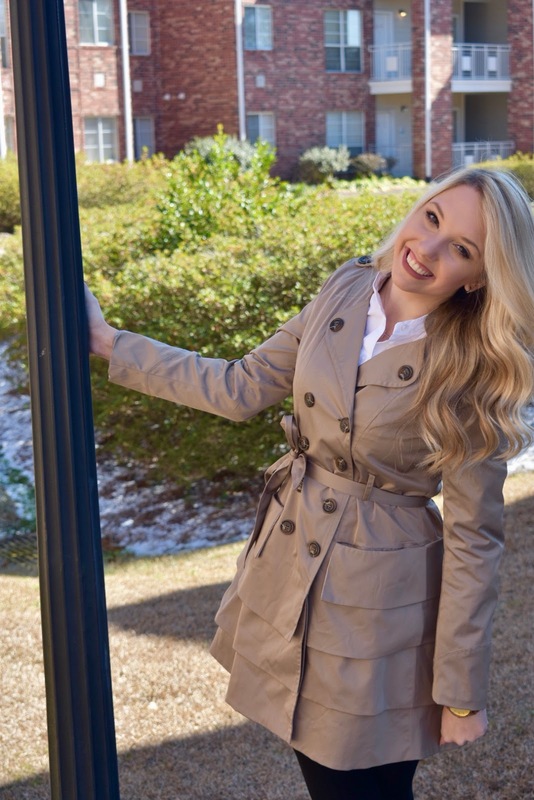 You guys let me know if you want a blog post with more information on how to style a trench! I hope you guys enjoyed this post, as usual if you have any questions leave me a comment below! Subscribe so that you can be notified whenever I post my Valentine's Day outfit inspo!